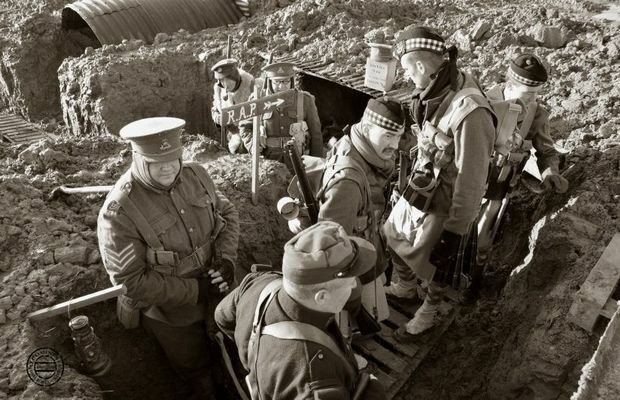 One hundred years ago, during Christmas 1914, incredible events occurred along the frontline. In several places, British and German soldiers decided to ignore war and celebrate Christmas in peace. Among the places in which these exchanges occurred, Ploegsteert Wood (Comines-Warneton), or “Plugstreet” for the British, was one of the main ones. Soldiers of both nations were staying in their trenches. They endured the same rain, the same cold weather, the same war which never seemed to end, but above all, they wanted to spend Christmas in peace. German soldiers had put trees illuminated with candles on the parapet of their trenches and started to sing Christmas carols. The British replied from their trenches with other songs until the two camps were singing “Adeste Fideles” together, in Latin. At the end of this prelude, the Germans asked for the British not to fire when they left their trenches promising to do the same in return if the British left theirs. This was the beginning of the truce. They greeted each other, shook hands, exchanged a few words and engaged in conversation, British soldiers sometimes playing the role of interpreter, although some Germans spoke English quite easily. They exchanged presents, food, cigars and alcohol, badges, belt buckles, and even uniform buttons. This marked the moment of Christmas. The soldiers of both camps buried their dead, fallen in No Man's Land, and repaired their respective trenches. British soldiers even borrowed tools from the Germans. A football game between British and German soldiers maintained this truce and fraternisation, which continued well into January 1915, despite any fraternisation with the enemy being punishable. Many written testimonies tell the story of a Truce at a place called Saint-Yves in the area of "Plugstreet" (see pages 11-13): those for example of Lieutenant Bruce Bairnsfather, Frank Black and Soldier Tapp, from the 1st Royal Warwickshire; of Major Arthur Bates and Soldier Graham Williams, from the London Rifle Brigade; that of Brigadier EMC Lieutenant Richards, from 1st East Lancashire; and that of Lieutenant Kurt Zehmisch from 134e Saxon. These events which are rather difficult to imagine taking place during a war, were reported in letters of soldiers sent to their families, and immortalised in photographs, proving that the Christmas Truce in the “Saint-Yvon” and the “Gheer” in Comines-Warneton is not a legend, but was the start of humanity in the trenches on Christmas Eve. In 1999, near the place called "Saint-Yves" (Warneton), a cross was left in 1999 by a group of amateur historians, in memory of the Christmas Truce that occurred in No Man's Land. The cross has today become a well-known landmark, thanks to the memory maintained by the patriotic association of Comines-Warneton. Many visitors stop there to leave balls or other symbols, reminding us that almost 100 years ago, soldiers forgot war for a moment, to make peace around a football match. To maintain the memory of this extraordinary event, every other year since 2007 the Christmas Truce has been commemorated in the locality of “Saint-Yvon” by a ceremony at Prowse Point Cemetery, and a re-enactment of the German and British trenches, and a symbolic football match on this historic place (organised by the local patriotic association), have taken place. UEFA will commemorate the 100th anniversary of the WW1 Christmas Truce on December 11th, 2014, close to the centenary of the date when soldiers from both alliances took part in a spontaneous truce, which included playing football on the territory of Warneton/Plugstreet (Ploegsteert) between the trenches. The place chosen for this commemorative event is Comines-Warneton, a Belgian town; the ground where the football match occurred is situated on its territory. A remembrance ceremony will be held at Plugstreet where the UEFA President will address the audience before inaugurating a monument at Warneton (St Yves) where the truce was a reality 100 years ago. "This remembrance ceremony," said Michel Platini, "pays tribute to the soldiers who expressed, a hundred years ago, their humanity by playing football together. They have opened an important chapter in the construction of the European community and gave example for today’s young generations. " This unique and extraordinary moment of peace and human brotherhood - where football emerged as a common language between people of different nationalities - is considered as one of the first expressions of an informal European idea. Re-enactment during two days and two nights, next the Christmas Truce monument. The re-enactors will immerse you in the context of the 1914 Christmas Truce. Discover the living conditions in the trenches and a nursing post. 17:15 Torchlight March from " Plugstreet 14-18 experience " to Plugstreet Wood Cemetery. All day long (10 :00 – 17 :00) Christmas market on Ploegstreet Main Square (next Church), animations. Shuttle between Ploegsteert Church / Plugstreet 14-18 / Christmas Truce monument and re-enactment site.